This is thirty first in the series on the rich cultural heritage of temples in India. The ancient temples of India are richly carved and they behold ones attention for their craftsmanship. 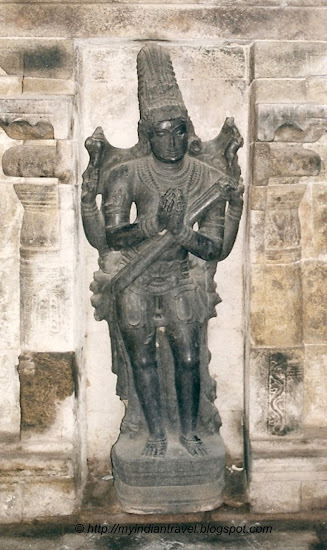 In the Chennakesava Temple of Belur there are several beautiful sculptures created in 1175 A.D. Here one can see beautiful carving of Lord Vishnu in a reclining position over the Adi Sesha with Laksmi near the feet on the external wall of the temple. This pose is known as Vishnu Anathashayanam. A beautiful sculpture in black stone at 12th century Airavateswarar Temple of Darasuram. Panchalingeshwara Temple in Barkur. A simple carving of 2 people on a animal at Mallikarjuna Temple, Basaralu. Great to explore the beauty of your country !! Beautiful! I like the carving of people and animal(goat?) on bottom right. Superb capture on the details of the sculptures! I really like seeing the details up close. As always you show us the most incredible sculptures. As always, the detail of these carvings and sculptures are exquisite! It is interesting to read your explanation of their poses. There is a wealth of history in India. I agree. the carvings are like Poetry in their motion. It certainly is poetry in stone! 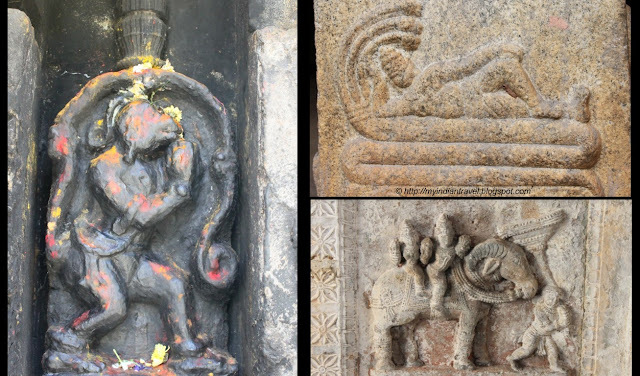 What a luck, that these great sculptures are still there and nobody has destroyed them. Those sculpts breathtaking sculptures in the Indian temples are truly amazing. I'd love to visit India someday, since I am related to a gentleman from India by marriage. Blessings! Incredible work! Thanks for sharing. I have been to Belur and Darasuram, absolutely mesmerising experience there! Evidence of a rich and interesting history...thanks for sharing.